Dr. Azita graduated Phi Beta Kappa with a Bachelor’s degree in Biology from Florida State University. She received her DMD degree from the University Of Florida College Of Dentistry. Dr. Azita’s fascination with the dental field began when she was in high school. She watched her mentor in her hometown of Tallahassee, Florida perform dentistry with so much enthusiasm and so much care for his patients that it instilled the drive into Dr. Azita to become a dentist. Dr. Azita’s passion is creating everlasting beautiful and healthy smiles for all her patients. 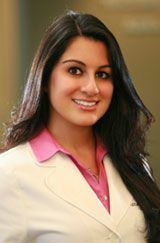 She strives to stay on top of all technological advances in dentistry and up to date with techniques by attending continuing education courses so that she can provide the best dentistry has to offer to her patients. In her free time, Dr. Azita enjoys reading, swimming, travelling with Michael, playing with their German Shepard Sir Dusty, decorating, and spending time with family. Featured on the Cover of Cobb County Woman’s Journal. Voted consecutively as “America’s Top Dentist” by national poll. American Dental Association, Georgia Academy of Cosmetic Dentistry, American Academy of Cosmetic Dentistry, American Dental Education Association, Academy of General Dentistry, Georgia Dental Association, Northern District Dental Society, American Dental Society of Anesthesiology, Alliance of the American Dental Association, and Hinman Dental Society.